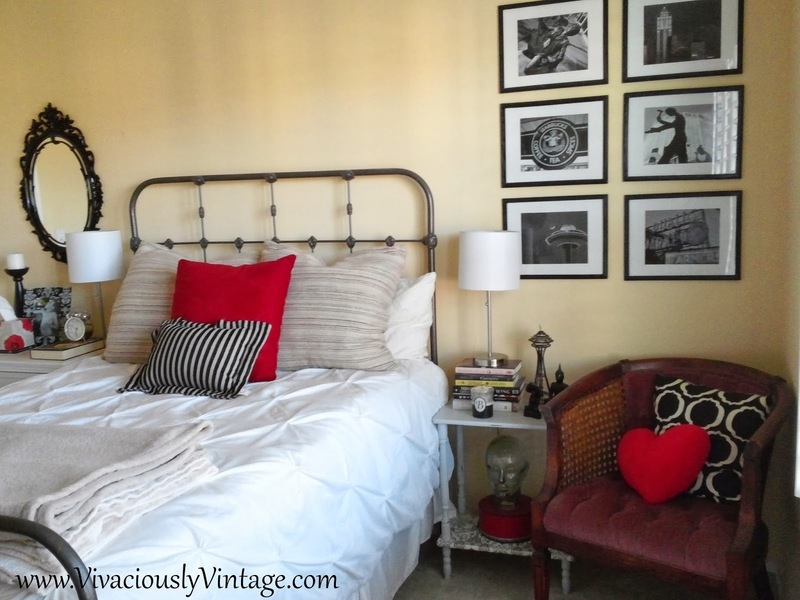 ...and a few guest room updates! Jeremy's old roommate came to visit us last week, and I'm sad to say that she's gone. :( However, I am happy about the project she inspired! Our guest room had this large blank wall above the bench. I just never really messed with filling it with anything, even though it made the room look incomplete. So as I was getting the house ready for company, the song from Beauty and the Beast got stuck in my head. You know the one that the candlestick and all the dishes sing? I was hoping around the house humming that song when it hit me that that'd be the perfect art project for the guest room! I stole a poster frame that kiddo no longer had hanging on his wall and used some poster board I had lying around for the background and black letters. 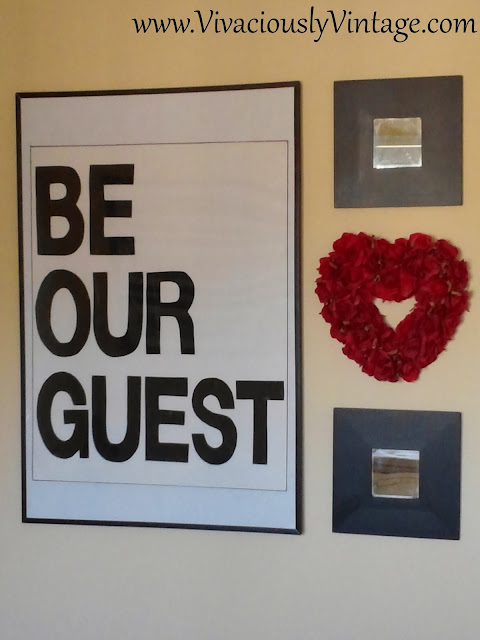 I used this image as a guide and simply cut the letters out of black poster board, gluing them to the white board. I had a bunch of these wooden mirrors around that I scored at Goodwill a long time ago (they were originally from Ikea). 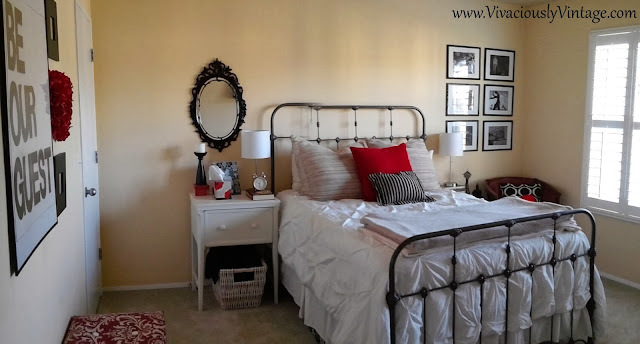 I simply painted the frames black and hung them along with an old heart shaped valentine's wreath (it's okay, I made this one last year to replace it!). The whole project cost me ziltch! It's wonderful how a small change can make you fall in love with a room all over again! 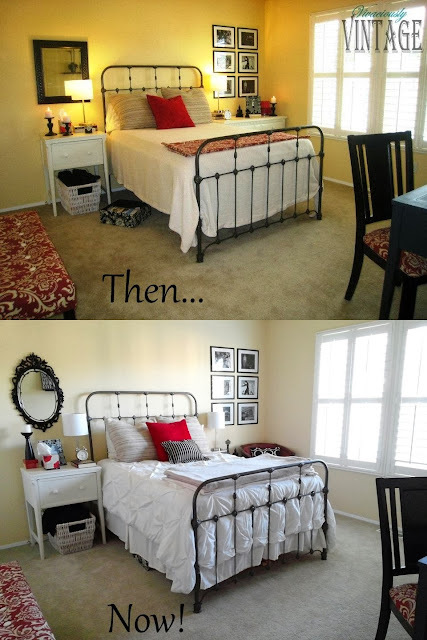 Speaking of small changes...let's see if you can pick out the differences between these 2 photos! I will say that I did not change the paint...it's just different lighting! Scroll down for the answers! 1. Swapped out the mirror. 3. Removed the red fabric at the end of the bed. 4. Lots of thrifted pillows. 5. Created a reading nook by replacing the dresser with a chair and this table. 6. Changed the accessories around a bit. 7. Added a dust ruffle! So, how many did you get right? Here's a shot from the other angle. I just love that little table and chair together! I'm thinking of ideas for the chair...that mauve color does not go! I'm thinking red, grey with a white or black painted frame, or, perhaps, a bright yellow! Thoughts?